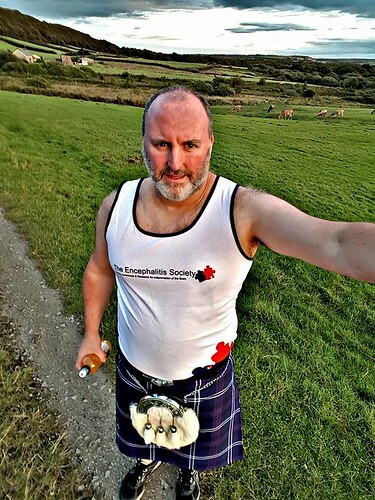 Anyone watching the 2017 Cardiff Half Marathon may have been struck by the sight of a Scotsman in his kilt and an Encephalitis Society running vest on the day. That man was Stuart McIntyre – also known as Hurricane Haggis – who has raised over £1,200 for the Society so far, smashing the £250 target he set for himself. Sadly, Stuart knows only too well the impact that encephalitis can have on individuals and their families. My brother Andrew contracted encephalitis when he was only two-years-old and as a result, was never able to walk, talk, or do anything for himself. He died in 1997, aged just 21. More recently, the sister of my friend at work also contracted encephalitis. She was just 17 at the time, and although there were times when things looked really bad, thankfully she's now recovering well. Over the past year, Stuart has added his support to a Mad Hatters Cocktail Party in Swansea in February which was organised for Jordana King. The family affair, which included a visit by Miss Wales Ffion Moyle, raised an amazing £4,500. Still, Stuart wasn’t finished and put on his running shoes for the Society to run the half marathon in Cardiff on October 1. The run went fairly well, although I found it a lot tougher than last year for some reason. The weather wasn't great, so there were fewer people out to cheer us on, but my friends managed collect a few quid in their bucket and blue tin, and I got a few quid on the way around too. My Hurricane Haggis stickers seemed to go down well with the kids. That slowed me down a bit, but I still managed to finish nine minutes quicker than last year, so I was fairly happy with that. The family of Nicholas Ashley are paying tribute to the life of a son, brother, nephew, cousin, and Godson by taking on the Great South Run in October, 2019. This is a blog by Nicholas' mum, Sarah, about the team's successes (and mishaps!). Encephalitis Society Take on the Three Peaks! Society Team take on a 25 mile challenge to celebrate our 25th year!